I was at Ft. Benning, Georgia. A friend of mine was a Cavalry Scout and his unit had come to Georgia for one reason or another. They didn't bring all their armor but did bring a couple of their bikes. My buddy, then a Specialist in the Army, let me ride it. It looked wicked, but it didn't have a lot of grunt like a gas powered bike. Not that power was a real problem. It could easily go fast enough to scare me, and had enough low end to do some impressive off roading withouth stalling out on me. Being Infantry I was always envious of troopers that had rides, but I was especially envious of that bike. Fun. Even loaded with all the equipment and gear. I am indebted to George at Madogre.com for taking the time out to contribute here. 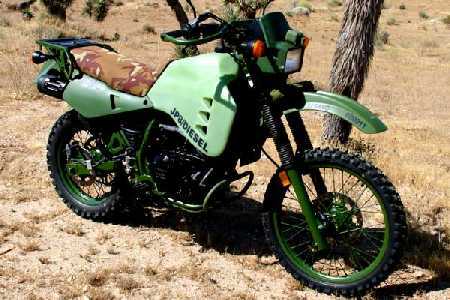 Have you ridden this motorbike? Why not send in your views here.